Our goal is to create a new breed of guitar magazine. Exclusively electronic, Pure Guitar will blend literate, in-depth journalism with the latest technological advancements available to online and mobile app users. We’ll bring you beautiful graphics, audio, video, and links to happenings in the wide, wonderful world of guitar. Without the space limitations of paper magazines, we can utilize online technology to deliver more substantial interviews, articles, lessons, and reviews. 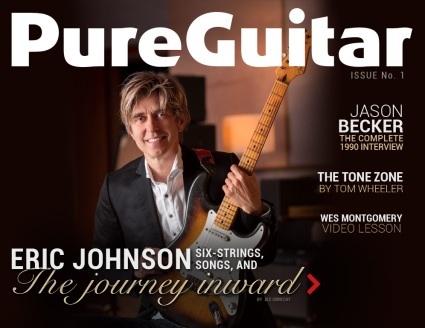 For example, our Issue #1 cover story offers the entire 12,000-word Eric Johnson interview rather than the abbreviated version a print magazine would publish. We’ve made available the complete hour-plus audio, so you can experience the conversation in real time and hear the inflection in Eric’s voice as he speaks about inspiration, creativity, spirituality and music, and how to make a Stratocaster – and its owner – play at their very best. In exclusive videos, he demonstrates his favorite guitars. In short, this ain’t your dad’s old magazine. I stumbled across a really cool picture site today. 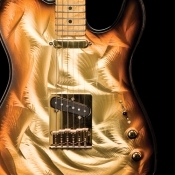 If you are looking for some super-hi-resolution guitar photos to use as background images on your Windows PC you will want to take a look at Blirk.net. They have more than just guitar images and they support the popular resolutions like 1024×768, 1280×1024, 1600×1200 and 1920×1200. Check it out! Great stuff! If you own a Gibson Les Paul or have been searching for information about the Gibson Les Paul, this is the place to go. The Les Paul Forum has gained the reputation for being “the Place” where some of the most knowledgeable and avid Les Paul owners, players, luthiers & collectors gather to talk, teach, and share all things Les Paul. They have over 900,000 messages posted from Les Paul enthusiasts! Next to playing guitar, my other passion is golf. Needless to say, this has been a tough week for my golfing hero, Tiger Woods. Golf has forever been known as “The Gentleman’s Game” where professional players call penalties against themselves and cheating does not not occur… at least on the course. I don’t possess the literary eloquence to explain how disappointed I am. And I’m just a fan. Don’t misunderstand, I am not trying to be Tiger’s judge. I could personally fill a season’s worth of “Life’s Most Stupid Decisions and Embarrassing Moments,” (should that ever become a TV Reality Show) and I am glad my private life is not splattered all over TMZ and the tabloids. We all need someone, or some thing, that we can believe in. Bill Withers said “we all need somebody to lean on”. What we really need is an anchor in our lives that will be consistent, trustworthy and forever loyal. For me, I rely on God, family and music. I believe those are good priorities to have. Getting a dog is not a bad idea either. The truth is… everyone hates to be lied to. For Tigers sake I hope the truth comes out (whatever it is) so we can all recover from yet another human being acting imperfectly human. Check out this early recording of Jonny Lang’s “Lie to Me”. The song is also featured on Jonny’s new release “Live at the Ryman“. If you love gritty blues from an artist turning toward contemporary gospel, then I recommend the new CD release highly. I am always on the lookout for new guitar related web sites. There are thousands of them out there and it’s a full time job keeping track of the new ones! While it’s true that any web site focused on the guitar will grab my interest, some of them will hold my interest longer than others. I think I found one of those today. 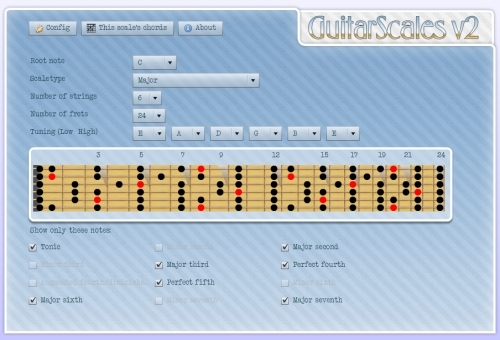 Click on the image to link to Guitar Scales V2. It appears that the site is still in development, but the product that is online now is absolutely killer. Virtually any scale you can imagine is available – Pentatonic, Major, Minor, Dorian, Chromatic, Mixolydian and more. Did you know there was a Persian scale? I counted 58 variations in all – viewable in any key you want! You can configure the display to show dots or notes. You can even set it up for alternate tunings. Best of all – it is 100% free! If you know of another cool guitar web site, let me know! OK, I realize this title may be offensive to some of you. Please forgive me, I just wanted to get your attention! 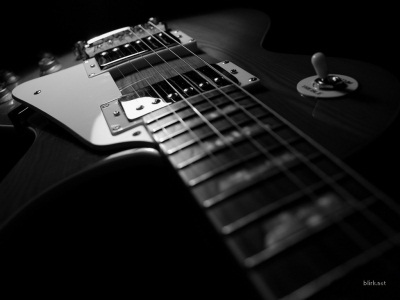 There is a new web site service for guitar “lovers” that is totally cool. The site is called GuitarAffair. This new site will offer you the ability to enjoy a wide variety of high-end, professional quality guitars, delivered right to your door. At home, on a business trip, or on a vacation, you will have the chance to treat yourself to a truly luxurious guitar, if only for a short time. We call our rental experiences “Affairs” because we want each rental to be a positive emotional experience for you. Whether you are on a business trip, a family vacation, or just want an escape at home, we stock a variety of superb guitars that we can deliver to your location for you to enjoy. If you’re on a trip, our Road Trip™ option will deliver a guitar, headphone amp, headphones, cord, strap, and your choice of a variety of instructional items or backing tracks, all in a single road case. When you’re done, just slap on the return shipping label and send it back. What could be easier? All of our guitars are professionally maintained to give you the best experience possible. Join – You must be a member in order to rent guitars from Guitar Affair. Because a rental is essentially a credit transaction, they run a credit and background check on all members. There is a $50, one-time membership application fee. You can apply for membership by completing the registration form. Select and reserve a guitar – Simply search their inventory to find an instrument that is available during the desired time frame. You can search the inventory by date, by manufacturer, or by genre. Receive your instrument – Your instrument will be shipped via UPS to your destination, be it a home, hotel, or vacation home. Their guitars ship in custom made Guitar Affair Gig Bags inside a custom made CaseXtreme shipping container. Have fun – Enjoy the guitar for as long as you have it reserved. Return it – On the return ship date, simply put everything back in the shipping container and ship it back. A return UPS label will be provided to you inside the case. So go ahead… have an affair… A GUITAR AFFAIR! Today’s Challenge: Call 10 of your favorite “know it all” guitar playing friends and ask them what they think of Gigliotti Guitars. I bet 8 of them will say…WHAT? Gigliotti guitars are among the finest custom guitars in the world. Impeccable craftsmanship, superb tone, and each one is a thing of beauty…actually a work of art. All Gigliotti guitars feature the unique and patent-pending Gigliotti Voicing System and unique metal plate top insert. This system allows the tops to resonate like a fine acoustic guitar, giving a rich and luscious tone with or without an amp. The photo to the left is a Gigliotti GT Custom Telecaster. The tops on these guitars look stunning and Gigliotti offers over 60 different finishes to make that metal pattern really stand out. They actually look 3-Dimensional! 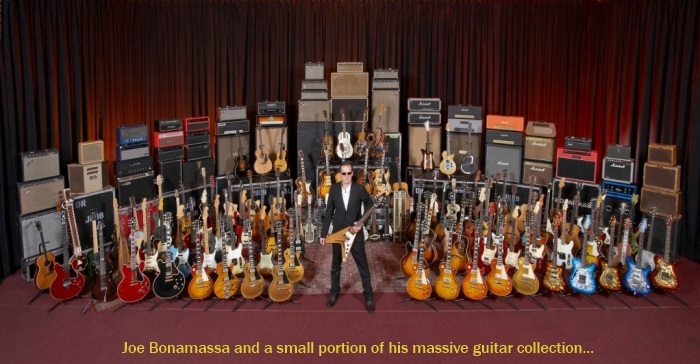 These guitars are not new, Joe Bonamassa has been playing a Gigliotti since 2005! Visit the official Gigliotti Guitar site by clicking HERE. They have some really cool videos, photos and computer screen wallpapers you can download for FREE. GuitarDaddy was scanning the blogs tonight…and came across a wonderful post at Axebay’s Blog titled: Thank You YouTube! For all of you (like me) that picked up a guitar AFTER Jimi played the Star Spangled Banner at Woodstock… YouTube is an incredible resource to experience the music and talent of the the true guitar heroes who were before our time. Without YouTube, I may never have seen those rare Beatles clips, Clapton in his 20’s, Wes Montgomery, Crosby, Stills & Nash or ZZ Top BEFORE they had beards. 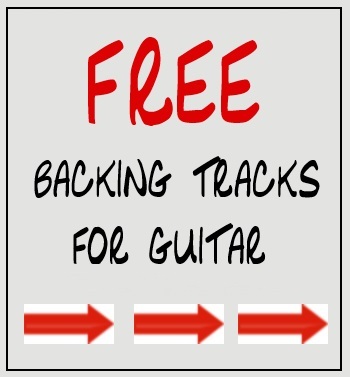 There are tons of great guitar lessons and product reviews too. Hey… stop reading what I have to say and read the original post by clicking HERE. If pictures like the one below are more exciting to you than the ones in the next Sports Illustrated Swimsuit edition, then I have a web site you MUST visit. Bjorn Riis authors a wonderful website and blog for David Gilmour fans titled Gilmourish.com. Click HERE to visit. The site is chocked full of “everything-Gilmour”… from David’s personal gear… to how to get David’s tone… to amplifiers… to some excellent quality backing tracks of those classic David Gilmour songs. 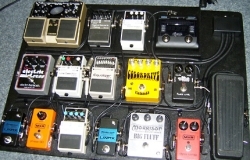 One of my favorite features of the site is titled “The Gear Gallery” where other readers have uploaded pictures of their own personal pedal effect boards and gear. Check it out by clicking HERE. It is obvious that Bjorn has put many hours into this fantastic site. Send him a quick note to thank him…and be sure to tell him GuitarDaddy sent you! A new documentary film takes a close look at 3 guitar players from different generations. The tag line is: “A Documentary on the Electric Guitar From the Point of View of Three Rock Legends”. Who are the 3 players? 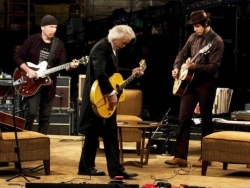 The Edge, Jimmy Page and Jack White! There is an exclusive review of the film at www.musicradar.com. The film’s Official Web Site has limited information, but I promise to keep the blog updated as new news becomes available! The film is set to release on August 21, 2009.